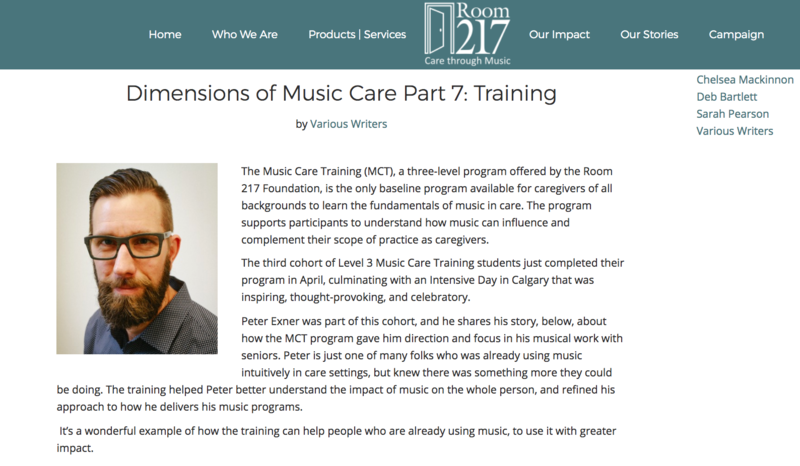 "The Music Care Training (MCT), a three-level program offered by the Room 217 Foundation, is the only baseline program available for caregivers of all backgrounds to learn the fundamentals of music in care. The program supports participants to understand how music can influence and complement their scope of practice as caregivers. The third cohort of Level 3 Music Care Training students just completed their program in April, culminating with an Intensive Day in Calgary that was inspiring, thought-provoking, and celebratory. Peter Exner was part of this cohort, and he shares his story, below, about how the MCT program gave him direction and focus in his musical work with seniors. Peter is just one of many folks who was already using music intuitively in care settings, but knew there was something more they could be doing. The training helped Peter better understand the impact of music on the whole person, and refined his approach to how he delivers his music programs. It’s a wonderful example of how the training can help people who are already using music, to use it with greater impact."